Spirals Of Manifestation: “The creative, rebellious path of love moves in spirals. It is not linear. Sometimes our mind decides that the way forward is to take clear steps from one point to the next logical point. However, there is a genius within that can guide us on an alternative route. If there is an unnecessary pothole or delay in the typical linear path of progression and the curved loop in the path will be quicker, more fun and more beautiful, then why not allow yourself to be guided to that path? This can happen through trust and wisdom rather than rigid adherence to what on the surface appears to be logical progression. You are in the midst of a spiral of manifestation. Something is coming into being, even if you think it is further away than ever before. How amazing it will seem when what you have been dreaming of, falls into place. Suddenly what you have been thinking of creating will plonk into your reality, seemingly out of nowhere – because it was just around the bend, just out of view on the spiral of manifestation and you could not see it coming. In truth, it was coming to you all along! This oracle has a message for you. Sometimes when we feel the furthest away from what we want, we are actually closer than ever before. Just one turn on the spiral loop of creation can see your manifestation taking root in the world. You must hold true to your faith and keep working on your progress. Forget about believing it when you are seeing it! Any old soul – or young soul – can do that! You are a bigger, braver, more ancient soul. You have enough chutpah to believe it so that you can see it sooner, bigger and brighter! Do not give in to those who tell you it should have happened already or that you have failed. They are just suffering from a lack of patience and understanding, as well as an arrogant assumption that their notion of timing is somehow superior to the greater divine timing at play in life. Be in good will with yourself and the universe. All is unfolding perfectly whether you feel it right now or not. 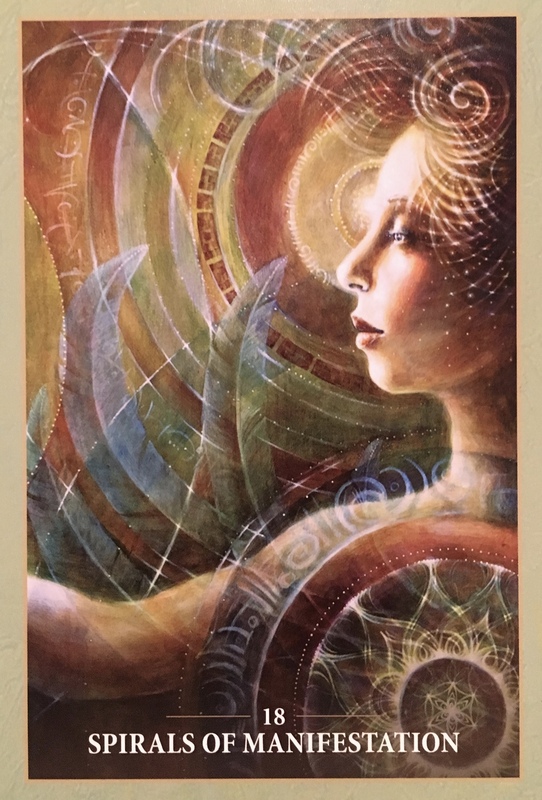 This oracle also brings a message to you about the perfect synchronicities that are taking place in your life. You may have started to notice these already. When we live from the heart, honour our creative center and choose unlikely but lovingly rebellious ways to be in the world, we will begin to notice synchronicity every day. It is as though the universe is speaking to us intimately, on all matters – which of course, it is. This oracle reminds you that there is no point rushing to the bus stop. If you are way too early, you are just wasting your time. Better to live your life at a more appropriate pace and get there at the right time. You don’t need the anxiety that comes from rushing towards your destiny. Try not to worry quite so much about the future. You will attract what you want and need so much more enjoyably if you relax and deal with the here and now. We are incredible manifestors; each and every one of us living in the reality that we have created ourselves, with our thoughts, dreams and feelings within the parameters of our self-imposed limitations and belief systems. Each of us came here for a reason, then agreed to the Great Forget. We agreed to try to remember, to discover ourselves all over again. And again. With each lifetime gathering skills, gifts and wisdom. With each lifetime learning lessons; ones that we cherish, and ones that we would rather soon forget. Manifestation is a co-creative process. We put ourselves out there, and the Universe comes to meet us. We think we have it all figured out, and we might get a curve ball thrown our way. And yet, somehow that curve ball was designed perfectly. It was all part of a grander plan. And if looked at in the right light, it may just be seen as a gift. It’s time to loosen up a little. Relinquish some control. Let go of the fear that things may not turn out the way you desire. Decide to be happy. Joyful. Peaceful. Fulfilled. Decide to be the portal of Light that will anchor the Unmanifest into the physical realm. With every breath breathe Light right into your heart and know that Love heals, creates, soothes, expands and awakens. As your heart expands, release the fear and allow the to Universe provide. Receive your blessings. Hello Dee, I am sorry that you are feeling unwell. Heal and get well, take care of yourself. I just want you to know that you were and are a daily inspiration. Thankyou for your wonderful healing guidance. They have truely inspired me on a daily basis. In truth I don’t know how I can explain the ways you have inspired me and many others. EVERY SINGLE DAY, the messages have been spot on the issues I have been dealing with, as they have brought me the abilty to delve deep inside. So thank you for your loving work.